Cover of the “Toronto Public Etiquette Guide” by Dylan Reid. The book, “Toronto Public Etiquette Guide,” by Dylan Reid displays an intimate knowledge of the habits and customs of Torontonians. The photo on its cover reminds me of the number of times I have seen people committing breaches of the rules in close proximity to signs asking them to refrain from such an activity. Other than smoking near “No Smoking Signs,” the most common one that I encounter is dog owners allowing their pets to urinate beside signs on lawns that state: “Please keep dogs off grass.” This behaviour is not mentioned in the book by Dylan Reid. Perhaps it will be added at a later date. However, the book is an excellent read and I thoroughly enjoyed it as it allowed me to evaluate my own habits to see if I conform to the behaviour that Torontonians expect. During the last decade, the issue of dogs peeing on private property has become more important, particularly in the downtown area. Green spaces are under increased pressure as parking lots and empty building lots disappear and become condominium sites. Due to the shortage of land, the green spaces surrounding new condominiums are quite modest in size. Despite this, maintaining the grass in front or around the buildings is difficult. Some buildings have garden committees, with residents working to maintain the condo’s garden areas. For them, it is very frustrating to find large brown spots on the grass due to dog pee. Fortunately, most dog owners are responsible and do not allow their dogs to defecate on the grass. I highly recommend Dylan Reid’s book. It’s fun to read and perhaps, you too, will evaluate your personal habits to see if you adhere to Toronto’s rules of etiquette when interacting with your fellow citizens. P.S. Dylan Reid’s book is available for a mere $15.00 at the Spacing Store, located in the building at 401 Richmond Street West. A Toronto custom that is about to end, even though it displays excellent public etiquette. During the past year, I have become aware of the number of transit riders on the TTC’s King Street line who, when exiting by the front doors, express thanks to the driver. Drivers usually acknowledge with a short response. There may be other cities where this occurs, but I have never witnessed it other than in Toronto. I observe this custom often as I now must sit in a handicap seat at the front of the King streetcar. It is truly a pleasure to watch these brief moments of personal contact between operators and riders. However, during rush hours, due to overcrowding, saying thanks does not occur as frequently. Unfortunately, when people ride the new streetcars on lines such as Spadina, they are not able to express their thanks to the driver as he/she is inside a protected cab. I love the new streetcars, but I am saddened by the demise of the friendly custom of expressing “thanks.” However, it will remain possible to do so on the TTC buses. In the novel “Arse Over Teakettle, Book One of the Toronto Trilogy,” the main character is a young boy named Tom Hudson. He tells of his father’s version of the ten most common characteristics of Canadians. Tom’s father is a proud Canadian, but loves to poke fun at himself and his fellow countrymen. His tongue-in-cheek sense of humour is reflected in the following passage from the book in which he discusses with his son the traits that Canadians share in common. 3. Canadians not living in the Toronto area, all know that it is an evil place, even if they have never stepped foot within its precincts. Astute political observers expect a Toronto Separatist Party to develop sometime in the near future. 5. Though Canada is not a Christian nation by constitutional law, the majority believe in a code of ethics that is similar to “Christian values,” whether they are a Muslim, Jew, Buddhists, atheist, or agnostic. The phrase, “I’m going to put up an agnostic tree next Christmas,” is as Canadian as hockey, maple syrup, or Tim Bits. 8. Patriotism is an internal emotion, independent of flags, symbols, and rousing anthems. Besides, most of them do not know the lyrics of their national anthem. They would hold their hands over their hearts when saluting the flag, but during most of the year, it is too cold to take their hands out of our pockets. 9. They are usually practical by nature, though it is said that Canadians are the only people in the world who step out of the shower to take a pee. 10. The “GST” they hate with a passion and love asking, “Can I pay cash?” (wink-wink). As well, they believe they should obey the law, even if it is inconvenient. However, they do not recognize any customs that refer to “tipping,” and resent adding the expected fifteen or twenty percent to their restaurant bills. It might be added that if Americans are asked the difference between a canoe and a Canadian, they reply that a canoe tips. Similar to Tom’s fictional dad, I am also a proud Canadian, but cannot not resist poking fun at myself and my fellow countrymen through my writing. I have written eight books, fiction and non-fiction, which employ Toronto as a background. My home page lists the books and provides a short description of their content. Two more books will be available in the spring of 2016 (see below). My most recent publication is entitled “Toronto’s Theatres and the Golden Age of the Silver Screen.” The publication explores 50 of Toronto’s old theatres and contains over 80 archival photographs of the facades, marquees and interiors of the theatres. It also relates anecdotes and stories from those who experienced these grand old movie houses. 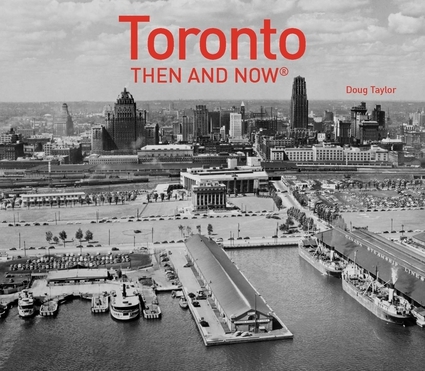 Another publication, “Toronto Then and Now,” published by Pavilion Press (London England), explores 75 of the city’s heritage buildings. This book will also be released in the spring of 2016.